Q: Do I Need A Lawyer During Divorce Mediation? A: No, an attorney is not required. Our mediators are certified by the Florida Supreme Court, and can complete the entire process without your hiring an attorney. In mediation, some clients are represented by an attorney from start to finish. Some clients hire an attorney solely to review documents before signing them. Most never hire a lawyer at all. 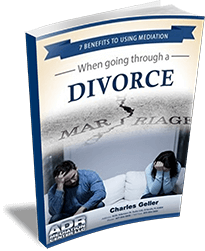 Q: How Long Does Divorce Mediation Take? A: Since all divorcing couples are different there is never a fixed time frame. In very general terms, a divorcing couple with children and certain assets and liabilities might expect their divorce mediation meetings to consist of one or two sessions totaling about 3-4 hours. Q: Can The Mediator Give Us Legal Or Financial Advice? A: The mediator is a neutral, impartial facilitator of the discussions. The mediator cannot and will not give legal, tax or financial advice, nor act as a therapist, although he/she may give guidance on how to seek such advice. Q: What Happens If We Can’t Reach An Agreement In Mediation? A: When couples cannot reach an agreement on some of the terms of their divorce, their case goes to court to settle those areas not resolved. And the family members are then at the mercy of the Court. We do usually reach a full settlement in mediation. Q: Is Everything I Tell The Mediator Confidential? Communications in the mediation process are privileged and confidential as allowed by law. Information received by the mediator from either party, outside the presence of the other, shall remain confidential unless the party consents to the sharing of that information. Mediation confidentiality supports negotiating in good faith, and in a way that supports both people leaving mutually satisfied. The confidentiality of mediation presumes that, during this process, that one would not discuss the specifics of the settlement agreement with, for instance, family or friends, as they may encourage you to pursue a settlement that they think is fair, rather than what was mutually agreed upon by you and your spouse. Q: What Information Is Not Confidential? A: Some information cannot be kept confidential. Any communication made in mediation about child abuse, elder abuse, or a plan to commit a crime is not privileged and must be reported to appropriate authorities under legally defined circumstances. Q: What Is The Future Uses Of Mediation? A: Mediation can also address conflicts that occur after a divorce is final. Couples may find themselves seeking a modification to the settlement agreement or child support. Conflicts may stem from disputes over time-sharing, child support, co-parenting plans, remarriage or potential relocation. Q: What Are The Fees And Costs Of Family Divorce Mediation? A: A complete mediation process with ADR Divorce Mediation Center usually costs less than the retainer for one attorney, not to mention the cost of two attorneys employed to battle the case out in court. With litigated divorces, costs can go sky high. Each party usually pays their own attorney a retainer of at least $2500, and fees go up from there based on time in consultation, research, discovery, telephone calls, letters, and court time. Our hourly fee applies to all time spent in meetings, and for extended phone calls. We have a minimum of one two-hour meeting with both parties, and a one-hour review and signing follow-up session. The average mediation takes from about 3-4 hours of mediation. The mediation session fee is paid at the end of each session, and the fee for assisting in the preparation of the documents is paid half before and half after preparation.